Atlanta's WABE-FM 90.1 radio has delayed the airing of their piece on the 1946 Winecoff Hotel fire until an unspecified day next week. 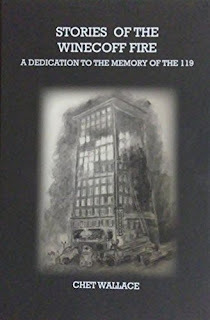 Winecoff Fire co-authors Sam Heys and Allen B. Goodwin are pleased to commend to readers a new book by Chet Wallace: Stories of the Winecoff Fire. First inspired by The Winecoff Fire: The Untold Story of America's Deadliest Hotel Fire, Wallace's book brings new width and depth to the saga. 119 people died, but who were they? Wallace's labor of love and respect for the fire's victims brings us the answers. 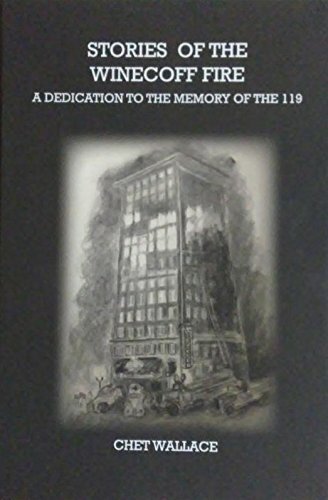 Wallace examines the back stories of 119 ordinary people who's deaths inspired the fire safety standards the world now relies on. We see the first half of the 20th century through their eyes and learn how their paths converged at the Winecoff Hotel in Atlanta December 7, 1946. “He reinvigorated our research and began turning up new witnesses and family members of the victims. 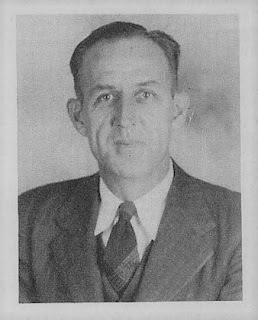 He located many of the victims' photos now on Winecoff.org's Remembrance Page,” added Allen B. Goodwin. Thanks to Wallace's reverent study, mostly forgotten victims of a tragic fire long ago emerge as a lovable collective still guarding the safely of millions the world over. The last living Winecoff fire firefighter has died: R. B. Sprayberry, 95. A career Atlanta firefighter, he rose to become chief of the department 34 years after fighting the Winecoff Hotel Fire. On December 7, 1946 Sprayberry was dispatched from Fire Station 12 on the second of four alarms. 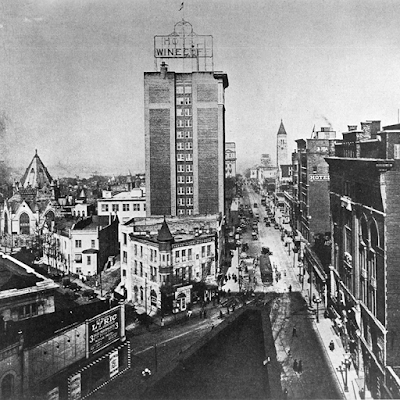 He was sent to work the back side of the hotel but eventually found himself on the Peachtree Street side and then into the building. Many were rescued. In 2011 he was among four living Winecoff firefighters honored at a luncheon commemorating the fire's 65th anniversary. Now the last of the Winecoff fire heroes are gone. He told an interviewer in 2011, "When you get my age (89) you remember some and you don't remember some but I'll remember the Winecoff. I was just a fireman at that time but I'll go to my grave knowing about it." Abandoned for twenty-six years, the old Winecoff Hotel building was a silent stain of urban blight on Atlanta's most famous street. And then at last, the sun rose on a new era of usefulness. The Winecoff Hotel building was re-opened as The Ellis on Peachtree Hotel in the fall of 2007. Relive the Ellis Hotel opening here. Winecoff fire survivor Richard Hamil recently discovered his father's YMCA advisor's ribbon. Carlos Hamil was the faculty advisor for the eight member 1946 YMCA Youth Assembly delegation from Rome, Ga.
Carlos Hamil kept the ribbon all his life, as he did a sense of guilt that four of his charges died on the tenth floor, even though there was nothing he could have possibly done to help them. 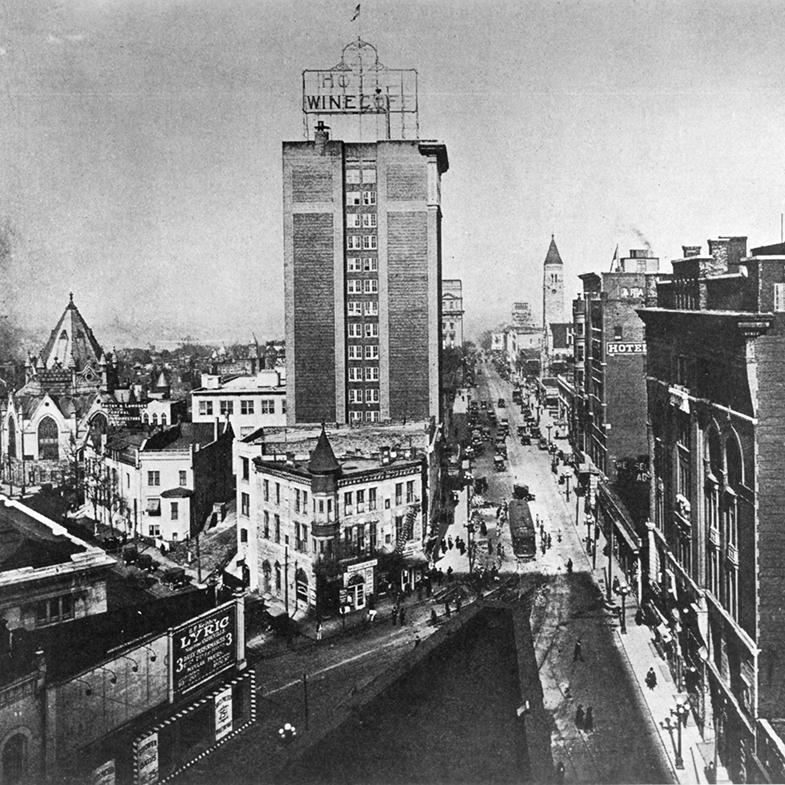 The Hamils were trapped on the fifteenth floor until they were rescued by ladder across the alley on the hotel's west side. A hero has passed. The Atlanta Fire Rescue Department's retired Chief of Training Raymond McGill passed away today. A hero of the Winecoff fire and a mentor to hundreds of Atlanta firefighters, Raymond McGill was one hundred years old. More here. Retired Atlanta Fire Department Chief R.B. Sprayberry is now the last living Winecoff firefighter.